The adorable grape–like kiwis you'll get from this duo are perfect for snacking. There are three big differences between these and your average grocery store kiwi. First, the plant's much hardier, so gardeners all the way up in zone 4 can grow it. 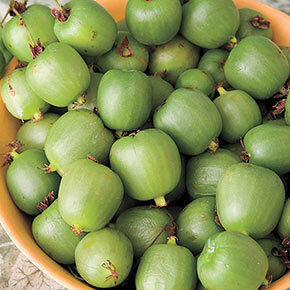 Second, the whole fruit is edible because it's skin isn't fuzzy or brown, but a pretty, smooth, green. Third, the grocery store fruit just can't compare to grabbing sweet, tropical–tasting fruit right from your own backyard. 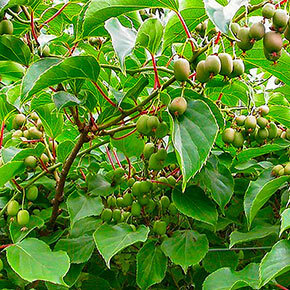 The female vine produces these delectable kiwis in early fall, starting in the third year. The male plant has gorgeous, variegated foliage. Both a male and female plant are required for fruit production, so we'll send you a set. Actinidia Ogden Point Female, Hardy Male Kiwi. Foliage Type: Female-heart shaped green, variegated with white and/or pink. Male-Deciduous green creates an attractgivew vine. 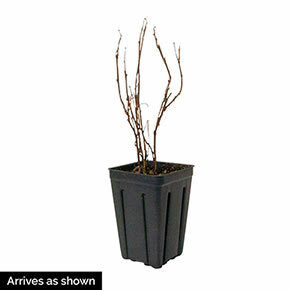 Pruning: Prune in late winter when plant is dormant. Remove damaged and twisted wood.